I Spy: Two Games in One: Double the I SPY fun! 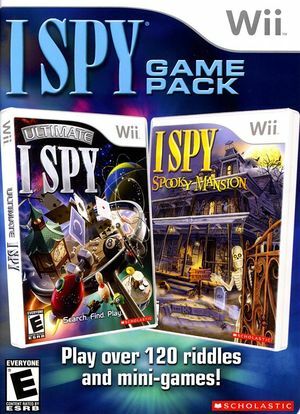 With this combo pack featuring two popular I SPY games - Ultimate I SPY and I SPY: Spooky Mansion - grab the family and play over 120 riddles and mini-games. As of a LibUSB update shortly after 4.0's release, certain computers may experience a hang upon savefile creation. This is due to various USB devices being checked by the game. If you experience this bug and unplugging all devices doesn't work, you can use a savestate/loadstate to unlock the game and save normally. The graph below charts the compatibility with I SPY: Two Games in One since Dolphin's 2.0 release, listing revisions only where a compatibility change occurred. This page was last edited on 12 January 2018, at 13:52.